Leica S3 is just announced by Leica and the shipping if the camera isn’t started yet, the camera features 64 MP Medium format sensor and standard sensitivity upto ISO 50,000. The Leica S3 is Leica’s first Medium format camera that shoots 4K videos. 1. This is how Leica S3 looks like when opened. 2. The rear side of the Leica S3 camera. 3. Leica S3 Main sensor board. 4. Leica S3 64 Megapixel CMOS sensor. Will you buy Leica S3 camera ? BTW, it’s listed on B&H but not available for pre-order yet. Leica camera AG registered a new camera in Taiwan’s certification authority NCC (National Communications Commission), the camera name is “LEICA SL . (Typ 601)”. Leica products generally arrives 6 to 8 months after registration, so the Leica SL announcement is expected in Q2 or Q4 of 2016. 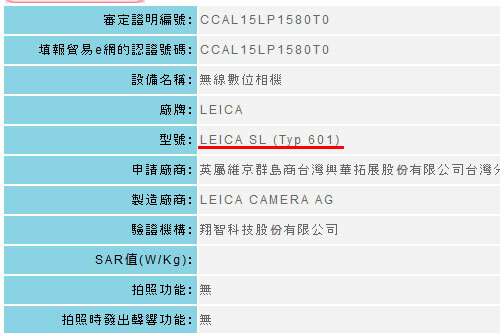 LEICA SL (Typ 601) details are completely unknown since the name of the camera and its model code is completely new. However, we can relate it with the Leica SE and S cameras. Leica S series is dedicated for Medium format cameras and I am 100% sure that the upcoming SL camera will be a Medium Format camera (yep, there is a big possibility). We have received emails, msgs and comments that the upcoming camera will be a fullframe camera with high speed AF and new lenses for this system is also coming, in an recent email we have also received leaked image of the upcoming device. Leica is moving very fast and announcing high quality products one after another, the recently announced Leica Q (Type 116) is very impressive and the overall core specification is even better than the Sony RX1 camera. Stay with us on Facebook to get latest updates about Leica Rumors and Product Announcement.